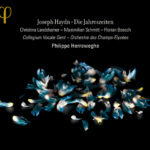 In Haydn’s Die Jahreszeiten (The Seasons) , it is not nature itself that takes centre stage, but rather man’s relationship to a natural world in which God is universally manifested. For some, its charming simplicity is the reason why Joseph Haydn’s four-movement oratorio from 1801 remains less popular than Die Schöpfung. In any case, it’s not the lovely music: the vivid language of Baron van Swieten’s rendering of James Thomson’s successful poem proved a real gold mine for Haydn. In this tonal representation of various animals and natural phenomena, he shows himself to be a true romantic avant la lettre.